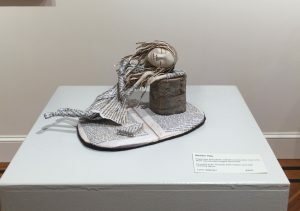 Walden Nap art doll in International Doll Artists. 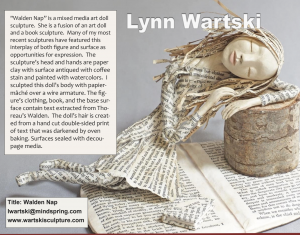 Walden Nap, appears in a brand new doll artist publication, International Doll Artists. 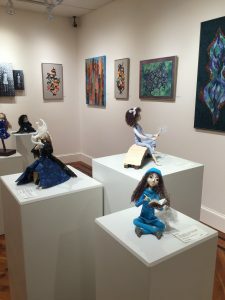 It is a quarterly publication that is by artist for artists, but I’m sure collectors, enthusiasts, and admirers will find something of interest as well. The print copy of this first issue is on it’s way, but you can purchase and download a digital copy right away. They include digital version with hard copy purchases as well. Be sure to register when they prompt you in the subscription process, so that you can receive your link for downloading digital copy. 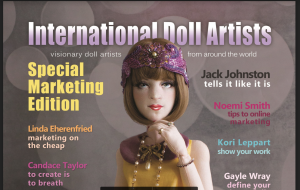 This publication is an outgrowth of the Professional Doll Makers Art Guild. I have been a member of this creative and highly talented group for a few years now. 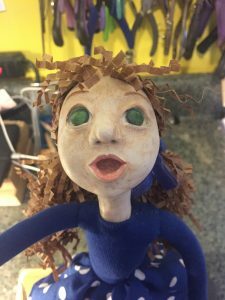 The art doll form started to take over my sculpture portfolio of work a few years ago. 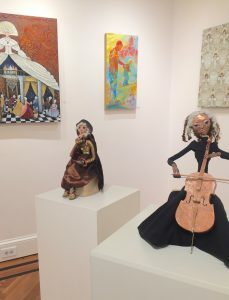 I found that these figurative sculptures had a unique and distinct audience, as well as a whole new world of tools, techniques, and materials. 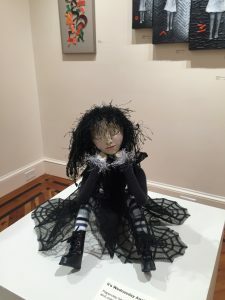 Finding some online groups in this genre to interact with has helped my art doll sculptures to evolve, and has pointed me to new venues in which to share my work. 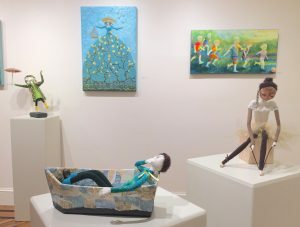 the PDMAG participates in doll shows, develops new artists through an apprenticeship program, and connects artists with each other and educational and marketing opportunities. 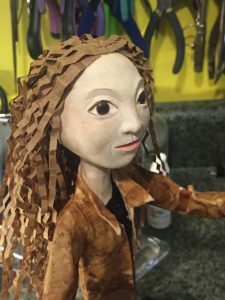 You may recall that an article, “Dolls From A Different ToolBox”, about my work appeared in the Spring 2014 issue of Art Doll Quarterly magazine. 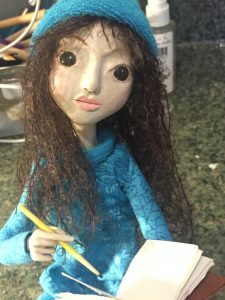 In that article I shared how the tools and techniques of my earlier metal and mixed media sculpture influenced choices I made in art doll design and creation. 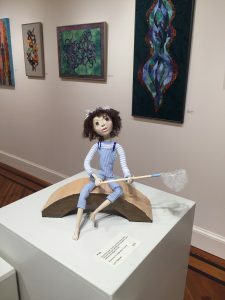 Last year, the Professional Doll Makers Art Guild also published a 25th guild anniversary book, that features work by more than 150 guild artists. That book can be found on the guild’s web page. 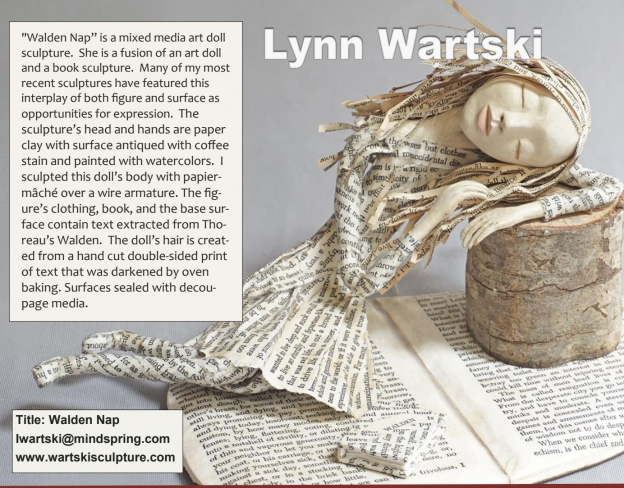 This entry was posted in Art Dolls and tagged art doll, art doll magazine, figure, figure sculpture, mixed media, one of a kind, OOAK, sculpture on October 10, 2017 by lynnadmin. Sometimes, the third time can be a charm. 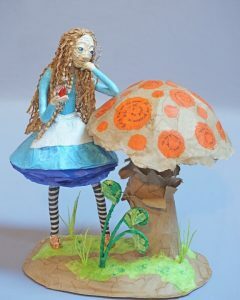 My latest addition to my portfolio of art doll sculptures is a rework of a rework. 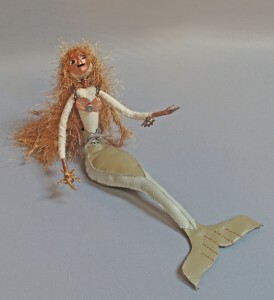 I created the first incarnation of this art doll, Mermaid’s Song, in late 2014. 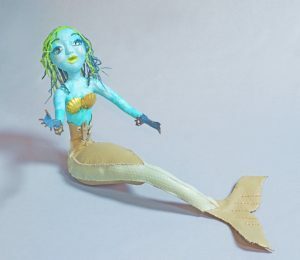 She was a steampunk mermaid with the hand sewn tail you see. 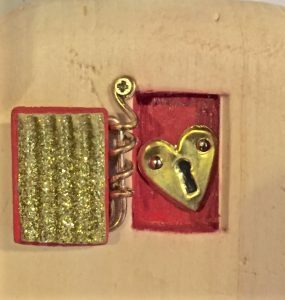 I fashioned this first figure sculpture the way I did the majority of my pieces at the time, with a hand-hammered copper face and hands, and a fabric body over a padded wire frame. Sometimes, there are certain elements of a piece you really fall in love with, and others, not so much. 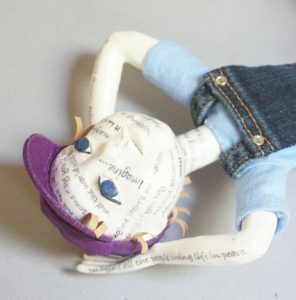 This art doll definitely fit that description. I was quite proud of the tail that I pieced and sewed from some faux leather from the Scrap Exchange. I weighted this tail with an internal sand bag that would allow the sculpture to lean her upper body back a bit to sing out loud. Her body I wasn’t as enamored with. In an attempt to make my mermaid more androgynous, I think I just made her kind of spindly. Also her face, though satisfactorily wrought, I applied with just a bit too much space behind it. This had the effect of creating very deeply set eyes, that appeared a little mad. I decided to rework this sculpture with a paperclay head last year. This second version I thought possessed kinder eyes and a mouth more open in song. I left the torso of the piece the way it was, but changed the fabric to a more “watery” color and pattern. This version was an improvement over the original, but I wasn’t completely happy with the face I had created. She appeared a bit too caricature-ish to me, and was still quite spindly. I think that the fact that I can’t find an image of this version tells a bit about my satisfaction with her. Mermaid Song needed another makeover, so I kept only her tail, hands, and the internal wire frame. I re-sculpted the rest of the art doll out of papier-mâché and paperclay. The surface color and her hair I created through tissue paper collage, and I also changed her proportions and positioning. 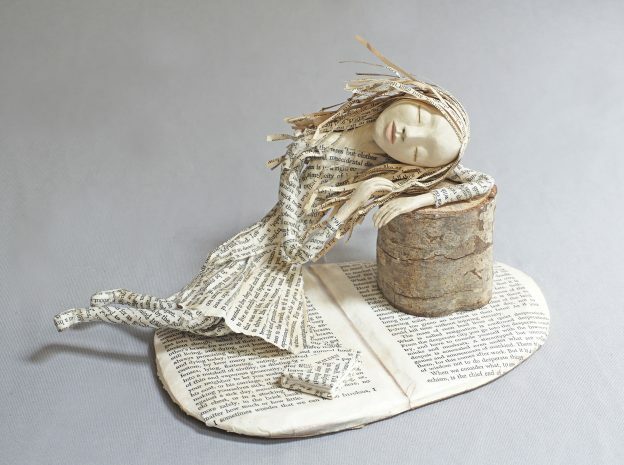 I am renaming this art doll sculpture 3rd Time Charm, and she now seems aptly titled. 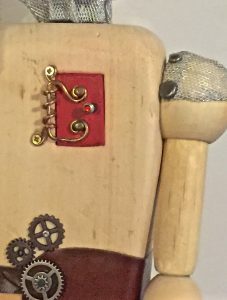 This entry was posted in Art Dolls and tagged art doll, figure, figure sculpture, mermaid, mixed media, North Carolina, one of a kind, OOAK, sculpture, steampunk on September 22, 2017 by lynnadmin. I have two new figure sculptures to share with you this week. That must mean it has been a few weeks since I last posted. I have been thinking a lot lately about my pieces in which I’ve incorporated text or images onto surfaces of the sculpture. There is an additional level of play and thought that this can bring to a figure. As with the last art doll sculpture I wrote about, “Local Star”, my two latest art dolls continue to explore this. “Learning to Defy Gravity” is my interpretation of Gregory Maguire’s main character Elphaba from the novel Wicked: The Life and Times of the Wicked Witch of the West. For those not familiar with the book, or the award winning Broadway musical adaptation, it is a retelling of the Oz story. In Maguire’s book the “Wicked Witch” isn’t so really wicked, nor is the “Good Witch” all she seems to be. I captured my Elphaba just as she is first getting her broom to rise from the floor. 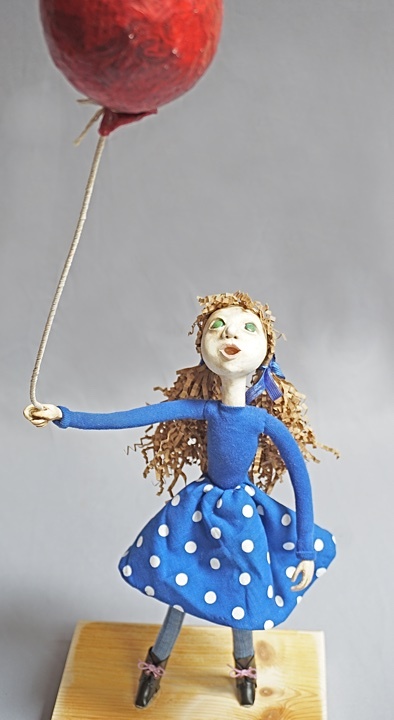 This art doll sculpture is a mixture of papier-mâché and paperclay over a wire armature. 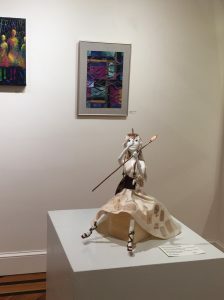 The color and clothing on this piece were sculpted in place using tissue paper. 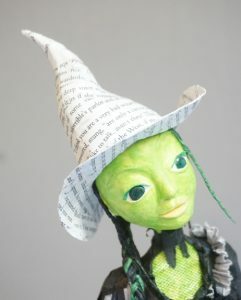 The magical elements of the figure, her hat, broom, and boots (shoes are always magical) are adorned with excerpts of text from the book. I chose passages from Wicked that question the nature of good and evil, and our preconceived notions of each. 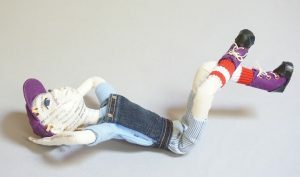 My second art doll sculpture this week is titled “Imagine“, and yes, he is inspired by John Lennon’s song of the same name. My young figure is laying on his back watching the clouds go by. Is he my version of a young John, thinking such thoughts?… Possibly. 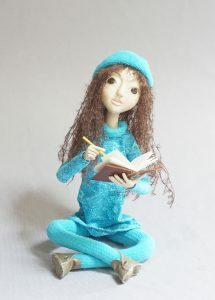 I just like the posture of the figure and the positive message, so decided to create a doll that captured that feel. This entry was posted in Uncategorized and tagged art doll, figure, figure sculpture, mixed media, one of a kind, OOAK, sculpture on August 21, 2017 by lynnadmin. 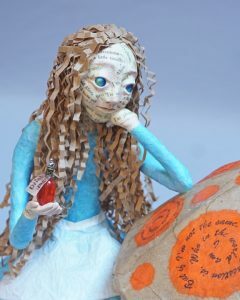 My newest art doll sculpture features a young figure looking up with awe at her bright red balloon. 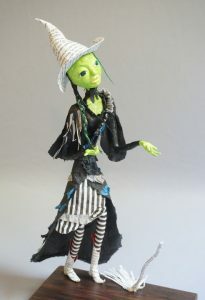 This mixed media art doll is a bit of fun, and another look back to an earlier piece. I wanted to feature gesture and expression with this figure sculpture. Guess I hit the mark, as one viewer commented that she “really looked alive”. I created Balloon 2’s head and hands from paperclay that is lightly tinted with watercolor paint. Her costume is sewn in place over a padded wire frame that is anchored through her shoes to her base. 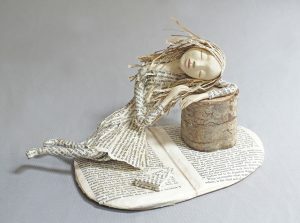 I chose to wig this art doll with paper fiber as well. Her curly pigtails are secured with blue ribbons that match her blue top and polka dotted skirt. Balloon’s boots are hand sewn faux leather with purple chord laces. My first balloon themed art doll figure was apparently being taken away by the balloon she was holding. This figure is being transported as well, but in a more figurative sense. I’m not sure what about her balloon is surprising her so. I guess that part of the story is up to the viewer. I crafted the red balloon itself out of traditional papier-mâché, and used red tissue for its top layers to achieve its bright color. The balloon “floats” atop a string made of cotton string wrapped around a steel core. I have left the base unfinished for the time being, but I think that I will most likely paint it before she takes a trip to the gallery. 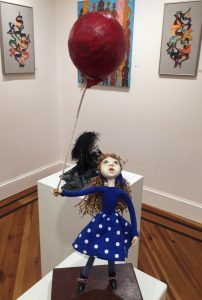 Balloon 2 will also make her official debut in June for my yearly Feature Artist show at the Hillsborough Gallery of Arts. I will probably not have a new sculpture to share next week. 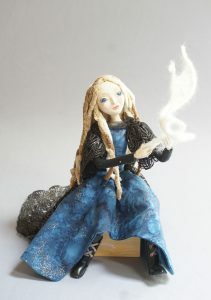 I am just putting the finishing touches on a commission piece, and she needs to go to her home first. 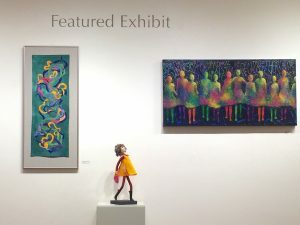 This entry was posted in Art Dolls, Art Shows and tagged art doll, balloon, figure, figure sculpture, mixed media, one of a kind, OOAK, opening reception, sculpture on March 24, 2017 by lynnadmin. John is an award winning Young Adult author. This is the first time we are working with a YA author, and the first time that all the HGA artists are using the same story. 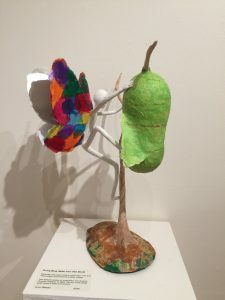 Our previous four shows have drawn from short story collections by Michael Malone, Jill McCorkle, Lee Smith, and Allan Gurganus. Out of Abaton: The Wooden Prince, is John’s retelling of the Pinocchio tale set in medieval Venice. 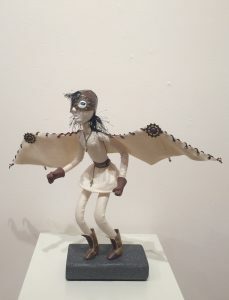 As you can imagine, a magical story with fantastic beasts, fairies, and the like would be right in a doll artist’s wheel house. After much personal debate, and quite a few unfinished sketches, I settled on the main character. Pinocchio is not a simple puppet this time around. 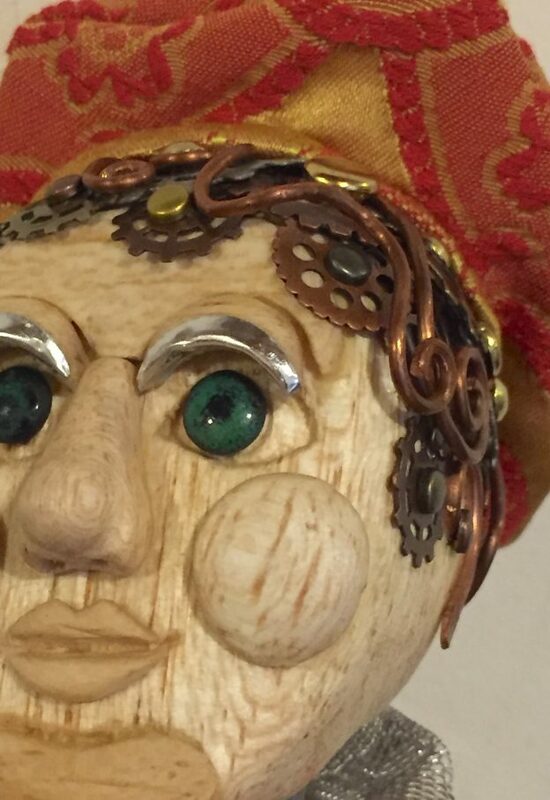 He is a finely crafted automaton servant boy who is automated, like all of of his kind, by magic from the kingdom of Abaton. His automation is slightly special and he is slowly becoming real as a result. I decided to depict my Pinocchio before his transformation starts. 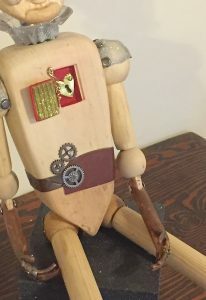 I am working with the title , “Servant Before You Are Real”, and decided to create him mostly of wood like his namesake. The photos throughout the blog post are Work-In-Progress pics. I will share a finished image when the show is installed in a couple of weeks. As usual, this show will open the “Last Friday” of the month on February 23rd from 6-9pm. HGA will also host a reading by the author on Sunday, March 5 from 4-6 pm. 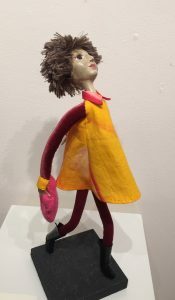 This entry was posted in Art Dolls, Art Shows and tagged art doll, figure sculpture, John Bemis, mixed media, one of a kind, OOAK, opening reception, Pinocchio, the Hillsborough Gallery of Arts on February 7, 2017 by lynnadmin.